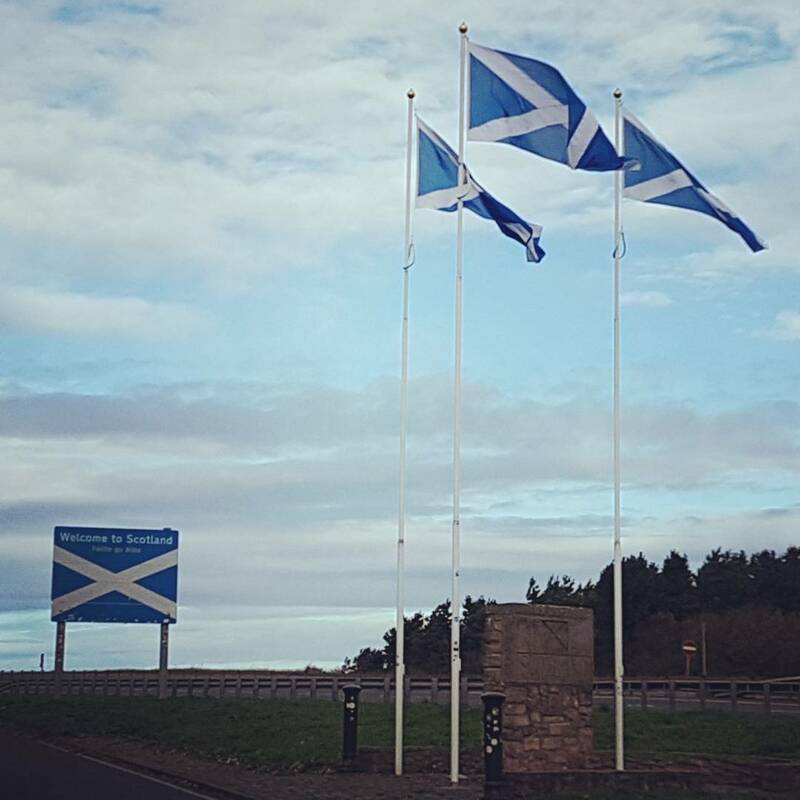 After our trip to Alnwick, Ryan and I continued our road trip up to Scotland and our next destination – Edinburgh. We spent 1 and a half days in the city and another at Edinburgh Zoo (post on that to follow!). 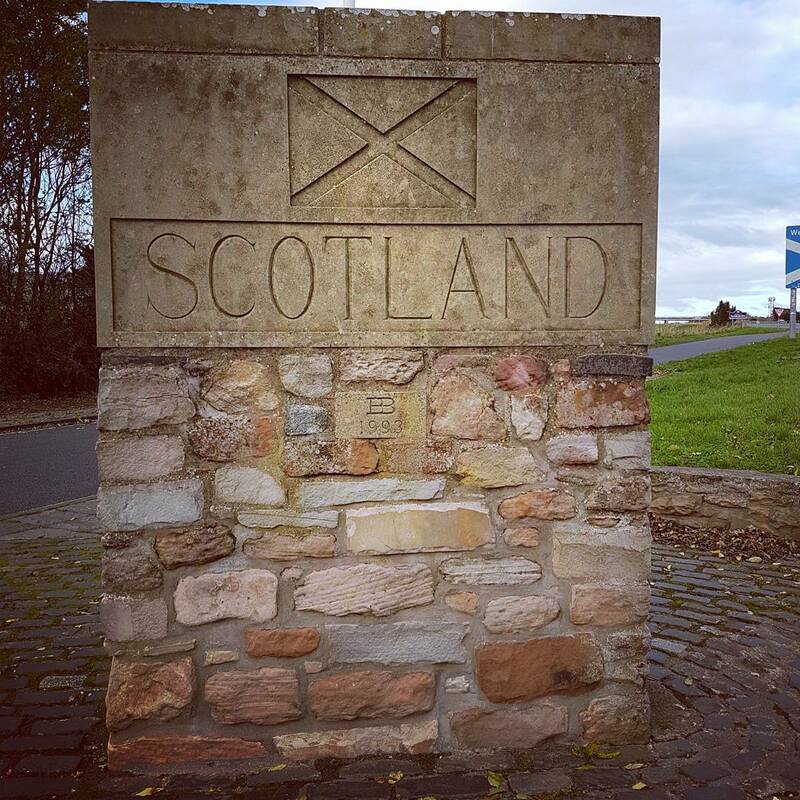 I got very excited when I saw the “border crossing” layby and insisted we pull over to take some photos. There’s also a layby the other side for those travelling into England. We arrived at our hotel, The Ibis Edinburgh late afternoon. It was on the outskirts of the city centre with a supermarket, small shopping centre and a tram stop a short walk away. 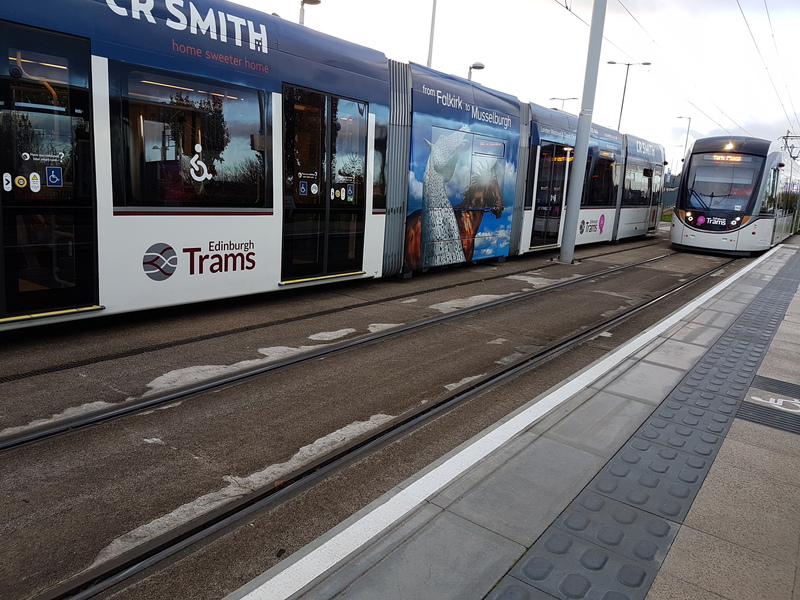 The tram line went to the city centre in around 15 minutes making the hotel an ideal location for us. The airport was also on this line. If you’re looking to visit Edinburgh on a budget or stopping over on your way to and from the airport, the Ibis is perfect and just what we needed for the short time we stayed in the city. All the rooms have free wi-fi and the lobby had a small shop selling snacks and a microwave to heat your own food. There was also a breakfast room / restuarant. The staff were very friendly and knowledgeable. They asked what we had planned to do in Edinburgh and told us the best way to get to the city centre (by tram) and to Edinburgh Zoo (a 10 minute drive away). Funnily to get to the Zoo by public transport would have meant travelling into the city centre first! Once we’d unpacked we headed to the tram stop and journeyed into the city centre. 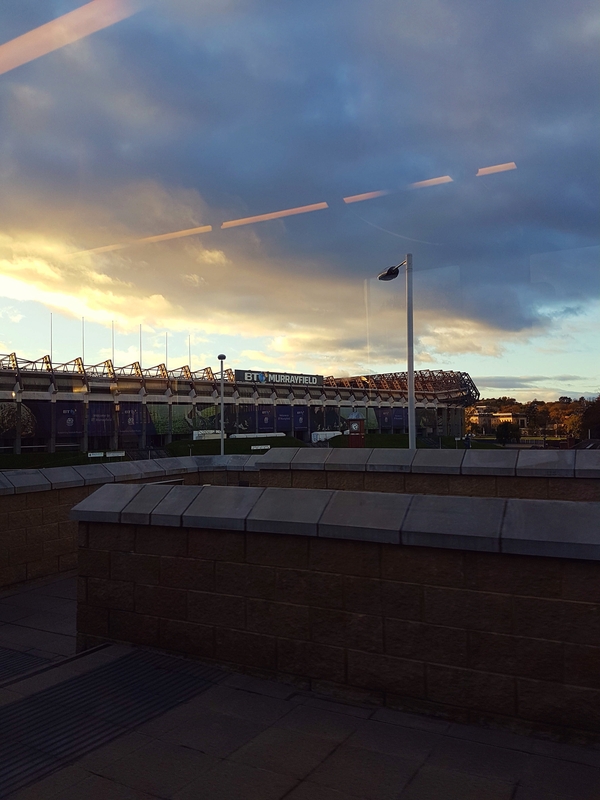 We passed the Murrayfield rugby ground on our journey and I failed to take a decent photo of it every time we hopped on the tram! Doh. We walked along Princes Street. One of the main shopping streets in Edinburgh and took in the views of the castle on the hill. OK, so it’s not actually a hill. Edinburgh castle is positioned on ‘castle rock’, but the view of the castle in the skyline reminded us both of the Ed Sheeran song, Castle on the Hill. Specifically this line. I took some photos of Edinburgh castle in the day light and during the sunset. However my favourite was on our way back to the tram stop after dinner when the castle was lit up. I also snapped photos of the Scottish Monument and the Scottish National Gallery as we as we headed for dinner. I think the architecture in Edinburgh is beautiful. We found a lovely burger bar, Foundry 39 which we chose for dinner. Their decor was quirky and they had some board games on the sideboard you could play. Which I loved. Toro Lounge in my home town (Cirencester) do this as well and it definitely encourages you to stay longer. Ryan picked one of their burgers, while I indulged in a pizza. We also ordered a side of mac and cheese to share. The food was great but on the pricey side, for two mains, two drinks and two sides it came to a little over £45. Bellies filled and tired from a long day of driving and sightseeing we headed back to our hotel. Edinburgh is a beautiful city and I fell in love with it in the few days we were there. It’s years since I visited Edinburgh. Your post has made me want to go back! Wow it sounds amazing!!! Love the sunset pics. The food looks scrumptious too but yes very expensive. Oh well, while on vacation, why not splurge. Edinburgh is such a beautiful place! It’s always great to have a day out there, I love going to the castle and I especially love going in the winter to the markets. So glad you had a fab time when you went. mmhmmmmm it’s not even 8am yet and that picture of pizza has got my mouth watering! !